Chinese culture and arts keep drawing worldwide attention, along with a fever for learning Chinese language, and the expanding influence of Chinese academic works. All of this derives from the cumulative legacy and innovations of a 5,000-year-old culture, the flourishing of the Chinese economy, as well as the progress of Chinese society. Alongside its enhanced economic strength, China plays an increasingly important role in the international arena. The rise of China has sparked world interest and more attention to Chinese culture and arts. For instance, Europe, in particular Germany, shows growing interest in China’s modern arts, traditional culture and architecture, as well as cultural preservation and heritage. Based on their own traditions and development, Western countries wish to understand contemporary China through its modern art and culture. The “China 8” exhibition debuts in Ruhr, Germany in May 2015. 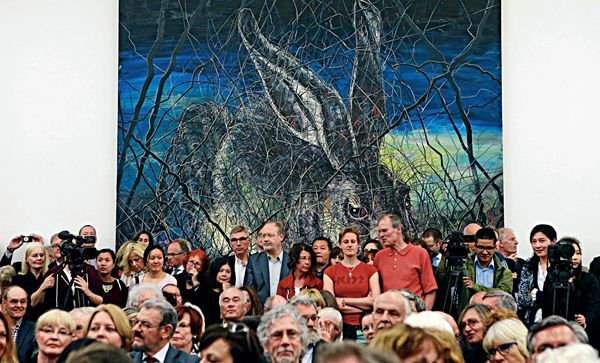 In 2015, “China 8,” a large-scale modern art exhibition launched in Ruhr, Germany, demonstrated the intense German interest in contemporary Chinese art. Held in nine galleries in eight cities, the four-month exhibition showcased over 500 works from 120 Chinese artists, attracting nearly 120,000 viewers and the attention of local media and officials. After attending the exhibition German President Joachim Gauck praised it highly. During a visit to China’s Tongji University in March 2016, he mentioned “China 8” again in his speech, commending its positive role in promoting cultural exchanges between China and Germany. Artists from the two countries now plan to hold a “Germany 8” in China.